A stunning young woman walks down a street in Florence, her head held high. All around, men playfully gawk at her grace and beauty. Just then the camera shutter snaps. “American Girl in Italy” isamong the most popular snapshots of all time, and it’s turning 60 years old this month. The photo, which was shot in 1951, perfectly captures the fun and romance of being abroad. In honor of its birthday, Ninalee Craig, the subject of the photo spoke with the “Today” show about what happened behind the scenes and what the photo really represents. Craig should know–when the photo was taken, she was a 23-year-old traveling alone through Europe. 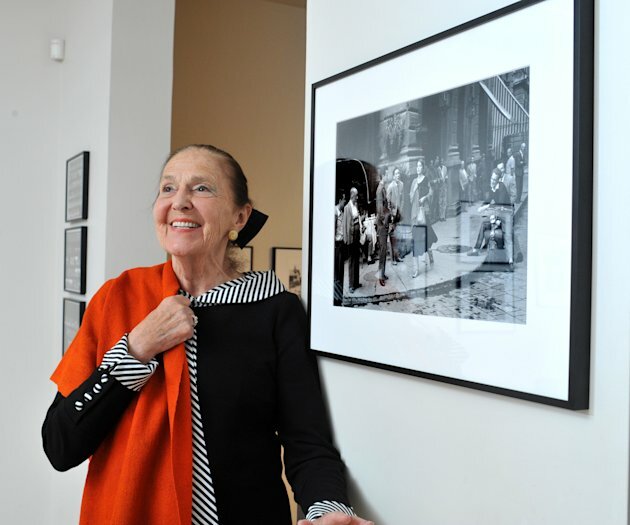 While staying at a cheap hotel, Craig met photographer Ruth Orkin, who was also touring the continent solo. The two spoke about the fun and challenges of being alone while on the road in Italy–and went on to hatch a plan to take photos highlighting that experience. For two hours, the photographer and amateur model walked the streets of Florence. Orkin took photos at markets and in cafes. The street-scene photo came about naturally. According to Craig, Orkin shot only two pictures of her walking down the macho street. One of them turned out to be the iconic image commemorated today. As for whether or not the photo was staged, Craig says no way. “The big debate about the picture, which everyone always wants to know, is: Was it staged? No! No, no, no! You don’t have 15 men in a picture and take just two shots. The men were just there . . . . 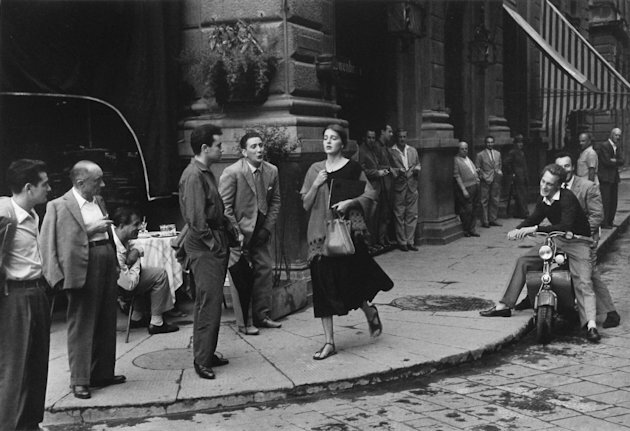 The only thing that happened was that Ruth Orkin was wise enough to ask me to turn around and go back and repeat” the walk down the street. In the interview, Craig also remarked that she never felt in danger while walking among the admiring men. “None of those men crossed the line at all,” she said. Craig is now a great-grandmother living in Toronto. Orkin, who passed away in 1985, went on to co-write and co-direct the 1956 Oscar-nominated film “Little Fugitive.” Of course, both women will be best remembered for one indelible image that, staged or not, captured the public’s imagination and never let go. Prob fake but def entertaining. Shaquille O’Neal is a big fan of President Obama. But the hoops star nonetheless blamed POTUS when Boston Celtics player Rajon Rondo had trouble putting the ball in the basket earlier this year. This excerpt, from Shaq’s upcoming book (via CSNNE.com), explains: In early March some of the guys went to the museum of Fine Arts for a fund-raiser and got to hang with President Barack Obama. Everyone was a little bit in awe. The President turns to Ray, points at Rondo, and says, “Hey, Ray, why don’t you teach this kid how to shoot?” Everyone starts laughing. … KG told me he saw the look on Rondo’s face and the kid was devastated, embarrassed. Dissed by the President, even though I’m sure Obama didn’t mean any harm. Rondo smiled and went along with all of it, but KG told me he could see it in his eyes. It bothered Rondo. It killed him. The next day Rondo shot the ball horribly. He stopped taking shots after that. He’s so sensitive. I think it was a real jolt to hear the outside perception of a basketball fan who happens to be the President of the United States. It messed with his mind. I’m sure of it. This is pretty funny. Even our boy Barrack notices Rondo’s poor shooting. Gotta love him still though, has more heart than anybody else on our team. Obama better watch himself or Kendrick Perkins will show him whats up. In case you needed more proof that watching excessive amounts of TV is bad for your health: new research shows that there is a correlation between the amount of time you spend in front of the TV and how long you live. A study by researchers at the University of Queensland in Australia has concluded that, for every hour of television watched after age 25, the average human lifespan drops by 22 minutes. A person who watch six hours of TV per day will, on average, live five years less than people who spent less time on the couch and in front of the television screen. Those are some scary numbers. The study tracked data from 11,000 Australian participants over the age of 25. It was published earlier this month in the British Journal of Sports Medicine. This study doesn’t prove that TV is quietly killing us. It’s more likely that lack of exercise and bad eating habits are shortening the lifespans of TV couch potatoes. A person who spends six hours a day staying active is almost certainly going to live longer than a person who likes to lean back in a recliner watching countless episodes of Judge Judy or Law and Order: SVU. It’s not just TV watching that’s bad for you, either. We recently learned that sitting in front of the computer for six hours a day increases your risk of death by 40%. And with Americans watching more video than ever, the health problem is growing. That’s why we’re fans of the stand-up desk. Just read this and even saw it on the news. Scary numbers. For all you couch dwellers, setup a bike machine in front of the tv and save 5 years of your life!